This project is an addition to an existing timber weatherboard house circa 1950. The client needed more space and wanted the new work to reflect the family's love of the outdoors and gardening, cooking, and family time, the needs of a teenage daughter and a Collie puppy. 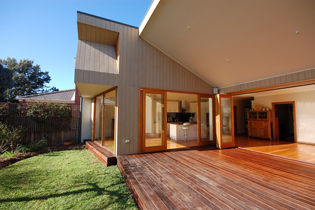 Timber was an obvious choice for this project. 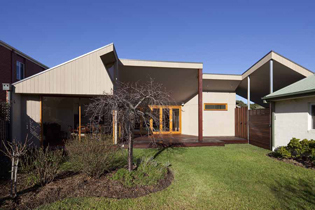 The addition is timber-floored, -framed, and -clad, and creates a new wing within the confines of the under-utilised side yard of the property. The existing rear lean-to structure was removed and a new external living space and carport was added in its place. The north-facing Living Room wall bi-fold folds away to the side at the deck, creating one large living space spanning inside and outside. The whole of it protected by its high raking ceiling over. The canopy provides a shady place with good ventilation in summer and shelter from wind and rain in winter while permitting solar access. The angular form of the building provides a counterpoint to the garden's luscious curves. The client pats the lovely old ironbark post and loves its warmth.